Caribou hunting was and is still an important means of subsistence for people like the Inuit, Naskapi, Montagnais, Cree, Dene	in	Canada. Caribou	were	hunted	by	groups from the arctic, subarctic, and	the	northern	part	of the	eastern woodland. In the past, the animals not	only provided	these	people	with	meat and grease, but also with hides and sinew for shelters and clothing, and bone and antler for tools and weapons. 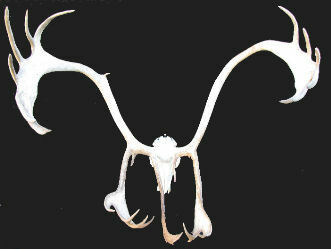 Large barren ground caribou antlers scoring 337pts.